See complete draws and instructions under “Amateur“. 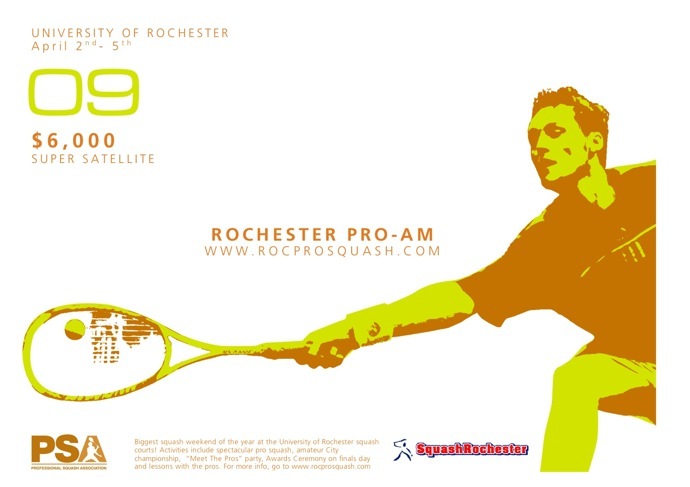 In less than a month, the 8th edition of the Rochester ProAm will kick off at the Lyman squash courts at the University of Rochester. The stage is set, the final entrant list and main draw is out and Rochester squash fans are getting ready for yet another exciting weekend of quality squash. From a Challenger event with 6 entrants in 2002 to a $6K Super Satellite event with 28 entrants on the PSA circuit, the ProAm has come a long way. In its first Super Satellite edition this year, the tournament will feature Ryan Cuskelly from Australia as the top seed. Ryan is currently ranked 69 on the world PSA rankings and with six of the main draw entrants ranked in the world top 100, the event promises some spectacular professional squash! Also on the cards is the ever popular Friday night “Party With The Pros” and the amateur city championship (more details on this soon). So mark your calendars, come down to the University of Rochester squash courts between April 2nd-5th and jump in on the action!